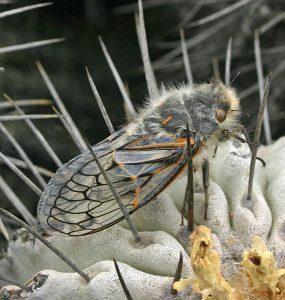 A cicada, Tettigades sp., on a cactus in Chile. The cicadas are a group of insects in the order Hemiptera (true bugs) closely related to the much smaller aphids and leafhoppers with more than 1,300 species worldwide and the majority in the tropics. The dog-day cicada (Neotibicen canicularis), also colloquially known as the dogday harvestfly or heatbug in some places, is the most common species in Wisconsin, although there are at least nine species that occur here. Like all cicadas, this Costa Rican species has a stout body. 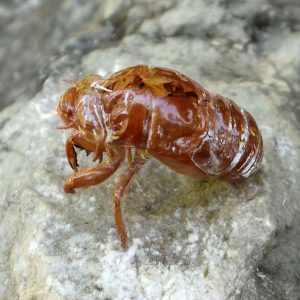 All cicadas have a similar shape, with stout, wedge-shaped bodies and a wide head with prominent, wide-set eyes on either side of a bulging nose-like structure (the post-clypeus), short antennae, and clear wings with noticeable veins that are held over their bodies like a roof. Dog-day cicadas are about 1½ inches long with greenish bodies with black markings. Periodical cicadas (Magicicada spp.) are black with reddish-orange eyes, legs, and wing veins. They cannot jump and do not walk or run well, so fly when they need to move more than a few inches. Cicadas are commonly eaten by birds, as well as bats, cicada-hunter wasps, ground beetles, dragonflies, spiders and robber flies, as well as other animals when there are mass emergences (and are consumed by humans in China and less commonly in other parts of the world). Dog day cicada, the most common species in Wisconsin. Most people wouldn’t notice the well-camouflaged cicadas at all if it wasn’t for the noise they make. Their persistent hum is the soundtrack of summer afternoons in the Midwest as the males “sing” to attract mates. The buzzing sound is created by rapidly flexing thin drum-like membranes (tymbals) on the underside of the abdomen at a high speed and amplifying the sound in enlarged chambers derived from the tracheae. The noise can be deafening when lots of males are calling all at once. Some cicadas produce sounds over 100 decibels! The repertoire of mating songs and other acoustic signals is unique to each species. 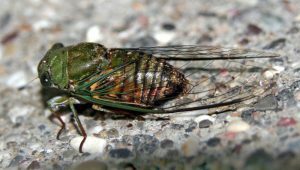 That of the dog-day cicada is often described as a loud, high-pitched whine similar to a power saw cutting wood lasting for several seconds before fading away. Females lack the tymbals so do not make the buzzing noise, but both can also make a different sound by flicking their wings. The small, elongate eggs are laid in slits in twigs. Photo by Lacy L. Hyche, Auburn University, Bugwood.org. Females lay small clusters of elongate eggs in slits cut with her a large, saw-edged ovipositor into twigs and small branches, favoring the tender twigs of one-year-old growth. The eggs hatch in 6-10 weeks and the young nymphs drop to the ground to burrow to reach the tree roots. The strong first pair of legs of the nymphs are modified for digging and excavating chambers near roots where they feed on xylem sap. There they feed underground on xylem from the roots for two or more years, only moving from their original feeding site if adverse conditions arise. In the last nymphal instar, each nymph constructs its own exit tunnel to the surface. The so-called annual cicadas take 2-9 years, while the periodical cicadas take 13 or 17 years. The dog-day cicada normally completes its development in two years. Once the nymphs have completed their development they emerge from the soil at night and crawl several feet up onto tree trunks or other vertical surfaces. There they split their exoskeleton lengthwise down the back and the adult cicada crawls out, hanging downward as its wings expand and harden, leaving the characteristic hump-backed shell (exuvium) behind attached to the tree. The adults are active for a few weeks in late summer, spending their time mating and laying eggs without feeding much if at all on plant sap. Cicadas emerge at night to transition from the nymphal stage to the adult. The nymphs (L) crawl out of the soil and onto a tree trunk where they split the exoskeleton and crawl out, hanging upside down as the wings expand, usually clinging to the empty shed nymphal skin until the wings dry. Various species: dog day (L or #1), periodical cicada (#3 and 5), and unidentified species in Argentina (#2, 4 and 7) and Costa Rica (# 6). Shed cicada nymphal skin (exuvium). “Flagging” or twig dieback from cicada oviposition damage. Photo by Robert L. Anderson, USDA Forest Service, Bugwood.org. Cicadas feed on the roots of many woody plants. Oaks are commonly attacked, but some other preferred trees include apple, ash, dogwood, hawthorn, hickory, maple, mountainash, and willow. 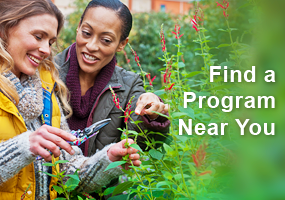 Some other of the more than 80 reported hosts they may be found on in Wisconsin include arborvitae, blueberry, grape, raspberry, rhododendron, spirea and viburnum. 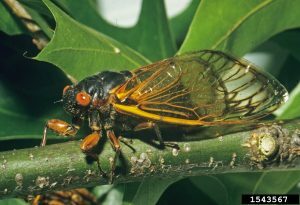 In addition to the root feeding (which is generally inconsequential unless populations are very high on young or small plants) damage is caused when the female cicadas lay their eggs. 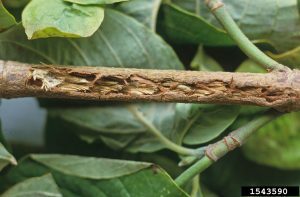 The oviposition slits often cause the twigs to split, wither, and die, causing “flagging” of the affected stems. Oviposition slits often cause twigs to split and die. Photo by Jim Baker, North Carolina State University, Bugwood.org. Oviposition scars appear as roughened punctures on twigs of many woody plant species. This is generally only a concern on young trees that have mainly branches that are of a size (¼ to ½ inch diameter) preferred by cicadas; established trees can tolerate a fair amount of flagging and is often considered a form of natural pruning. Injury to young trees or shrubs may result in the death, or more often, the disfigurement and loss of form due to attack of the tender leader shoots. 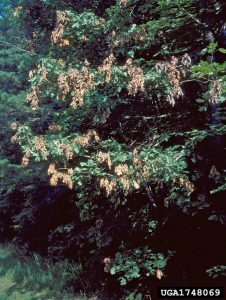 Epinasty, an unnatural curvature of the new growth resulting from more rapid growth on the uninjured side of the branch, and breakage of the current season’s growth are the most common symptoms. Annual cicadas rarely need to be controlled since they don’t occur in huge numbers simultaneously. Twigs severely damaged by periodical cicadas should be removed and destroyed to prevent the eggs from hatching to produce another generation of cicadas. 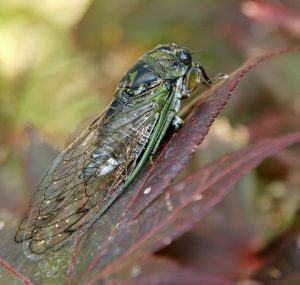 Delayed pruning of ornamentals from the fall prior to a predicted periodical cicada emergence until after damage has been done can reduce the amount of plant material removed. Very interesting article. There was so much info that I never knew about Cicadas. Well, I know of cicadas and thought the emerged every 7 years in Wisconsin. I didn’t really know any details until I read this article. I didn’t know they had a special membrane called tymbals for making the sound they make. I also didn’t know it was only in males. I have learned a lot. I also think they are eye-catching insects, but I can’t say they are actually attractive. How many times does a female lay eggs? Growing up in Milwaukee, listening to the cicadas was one of the joys of summer. I never knew much about them before. They are very interesting creatures. When I was a child I used to hear the cicadas singing at my grandmothers house. They were very loud and often overshadowed the birds song! Would love to hear some of the other varieties in the future. Read for edu credit. When you hear their “song” …you truly know it is summer. Interesting creatures. Late this summer I felt something plop on my head at Ravinia and when I looked down I found a fresh green young adult that fell from above while drying its wings apparently! Ewww! but before that I only heard them and never saw one, only the dried exoskeletons. The photos of the nymph transition are amazing. I always hear them, but haven’t seen one in a long time. What a interesting insect! I had no idea there was more than one species. I love their sound in the summer time. Very interesting article! We heard lots of them as kids in Illinois. Not as much here in northern Wisconsin, but the sound always signifies the end of summer to me! Very good pictures. What interesting creatures!!! I have found many exoskeletons over the years. Great article and it was fun reading everyone ‘s comments! This is the 4th year I have seen them. Cicadia Mania ID my cicadas as Citrus Cicada in 2017 and since then I have sent two mycolgist about 18 specimens each and both mycologists, one in New York and one in West Virginia told me that the cicadas emerging from my yard have Ophiocordyceps Sobolifera. They can tell me what kind of fungus they have, but now that I know that the cicadas emerging from my yard are infected with this fungus what do I do now!? I have a lot more emerging from the ground this year. I planted several Ash trees and I believe the root system is providing them food as my Ash trees seem to be “flagging”. The nymphs emerged 13 days late this year and instead of emerging at night they emerge in the morning, come to the surface and crawl back in their hole, they seem confused. 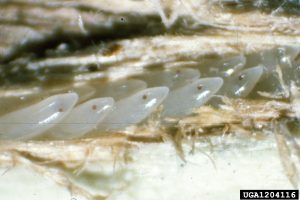 The nymphs who show the fungus stop an inch or two before the surface as the fungus begins to grow through the surface. Although there has been cicadas growing to adult stage the population seems to have diminished and I barely hear them compared to last year, it was deafening. I need real answers to why this is happening in my little ol yard in Arizona. If you can’t answer these questions but know who can help please reply with that info, or let someone know. If you want to see something unbelievable, and the reason I’m looking for answers, all you have to do is look at the pictures and the video I took removing one from the soil in my yard. Thanks! Very interesting—full of WHO KNEW???? facts. This year for the first time we had one sitting on a chair on the deck ( first week of August). I have memories of my sons collecting the exoskeletons in a jar and bringing them to show me. And they always seemed to remind me that summers are way to short. I found the article to be interesting about the different species and cycles as well as the oviposition slits and flagging damage that can be caused. Interesting article. Not one of my favorite bugs but I do find them somewhat interesting. I hope I’m still around for the Brood VI emergence in 2024. I always enjoy the orchestration. It seemed this year the Cicadas started early in July around our home in Jefferson. Some evenings recently the sound was deafening when you stepped outside in the evening. Very interesting that since the annual cicadas are not synchronized some of them appear every year but the periodical will emerge at a certain location every 13-17 years all in one night. Southern Wisconsin counties are due in 2024. This was an interesting article. The slitting of the twigs and branches of one year old growth of trees and bushes with the females’ large, saw-edged ovipositor is truly amazing. The pictured eggs was something I had never seen before. I definitely have several dog-day cicadas in my yard. They seem to like the maple trees I have in my front yard. So far, they have not caused damage to the trees. I didn’t realize the ones that emerge every 17 years and the ones we hear every year were actually different species. I thought they were just off-cycle. I’ve never seen the twig damage they do but will look for it in 2024. Very interesting article! Their songs are so summer. Interesting insects that are fun to teach my students about. Thank you for this article. I didn’t realize they were related to aphids. I have seen the exoskeletons on hybrid elm trees in my yard. I had no idea they lived underground for so many years before emerging, or that they fed on xylem from tree roots! Fascinating article! I certainly didn’t know they were related to aphids! I now know what causes that injury to young twigs on trees. I did see a periodical cicada on our maple tree, years ago. I wish I would have marked the year. At the time we were living in Racine, WI so I guess I’ll have to watch for them in 2024 when they are going to come out again. I am happy I don’t have to eat them. I watched a program about the ones in Australia…the noise was deafening. My family and I were out west last summer and stayed at a campground in the Badlands of South Dakota. It was 105 when we arrived and the sound was deafening. There were thousands and thousands of cicadas calling. I’ve never heard anything like it in my life. It went on all day and night until a short-lived storm passed through. After that, silence. The next morning there were cicadas everywhere…on the ground, soda machines, trees, even in outdoor sinks. They moved so slowly and clumsily that my kids and I relocated at least 100. I’ve seen cicadas many times in my life but this I will never, ever forget. I didn’t realize we had annual cicadas. It was nice to get the information on their life cycle. 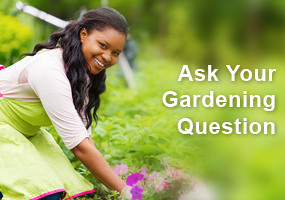 Also when to prune the bushes. Very interesting article. I am marking on my calendar spring of 2024 to search out a concentration of brood XIII in southeast Wisconsin. Enjoyed revisiting “true bugs” in Susan Mahr’s article. It was a chapter in master gardener class I thought wouldn’t be interesting. 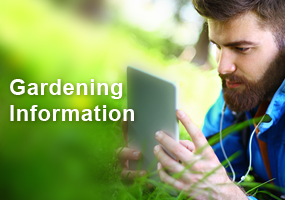 After reading it and listening to our guest speaker, it ended up being a favorite and very informative and useful in my gardening here. Was good to know the Annual Cicada rarely needs control, and I saved this article for future reference. I found it interesting that they can live under ground for so long. And thank goodness they are so little. If they were really large they would be downright scary. There are annual cicadas and periodical cicadas. Brood XIII isn’t due again in our area until 2024. Annual cicadas don’t cause much if any damage so don’t need to be controlled. The males are the noise makers and can get over 100 decibels. Learning about the lifecycle and when our next large “outbreak” is expected was interesting.